During a recent trip with A. I had an unforgettable moment where I realized just how madly, truly, deeply I've fallen. Nearly three years together and it still amazes me that right when I think I've stretched my heart to the limit, the curtains fall back to reveal a whole new expanse. If this is the case, I can't even fathom what a parent feels for her child because that night I realized the immense capacity a heart can hold, give, and feel when you strip love to its purest form. Once I let myself sink into it, I saw how useless it had been to ever hold back or be so insecure. His voice seemed to swirl all around me like a silk ribbon carrying these perfect little notes, a pied piper leading me through the night to a place that was soothing and safe, a reachable shelf where I could finally let my guard down and accept that I could be loved simply as I am. And that I could become so in tune with another person on such a level that we know how to respond to each other's beats without saying a word. It was intoxicating. It moved me so much that I haven't been able to let that experience go. I've been thinking about it, learning from it, craving it, smiling at how wonderful that moment felt, still riding on the tail winds of that beautiful night as it continues to permeate through me. 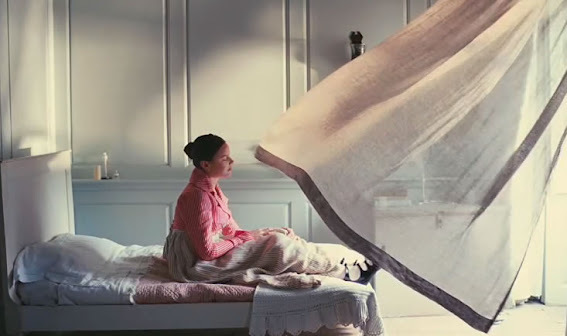 So in the hopes of continuing to kindle that punch drunk love, I decided to finally watch Bright Star and stir up those emotions again through the love story of one of history's greatest English Romantic poets. I sometimes have a hard time understanding poetry and doubt that I'd ever read a John Keats piece before, but wow if the man didn't completely captivate me with his words. Yes, I'd get lost in the profundity of his character's lines, but when he had me, I was floating in midair, so still and breathless as if time had surely stopped. The one below left such an impression on me, I've since scratched out the word "poem" and substituted "love" for it instead. Fanny Brawne: I still don't know how to work out a poem. John Keats: A poem needs understanding through the senses. The point of diving into a lake is not immediately to swim to the shore but to be in the lake, to luxuriate in the sensation of water. You do not work the lake out, it is a experience beyond thought. Poetry soothes and emboldens the soul to accept the mystery. Too often I try to find explanations for things that don't necessarily need explaining because doing so weakens it; it should just exist. Like explaining the punchline to a joke, trying to find a reason as to why love is the way it is cheapens it as it's very existence should be reason enough to run towards it, allow it to flow into you, to bathe yourself in it. In letting myself fall unabashedly into the lake, floating, drowning, wanting it to wash over me, around me, through me, I understood that there's just no other way to feel it so completely. So it's best to jump in, suddenly, with clothes and all, instead of waiting by the shore afraid of sharks that might never come. So beautiful, Dorkys. I was just at a wedding and the couple said the exact same thing that you wrote about here - love fiercely, without reservation, it's the only way. Took you what might have seemed to be a long, long time to find this place. I hope you are forever drowning while intoxicated.